The European Space Agency's first Vega rocket lifts off from Guiana Space Center in Kourou, French Guiana in a flawless launch debut on Feb. 13, 2012. A brand-new rocket soared into space early Monday (Feb. 13) in a launch debut that carried nine small satellites and the hopes of the European Space Agency all the way into orbit. The space agency's new Vega rocket, which is designed to launch small satellites, blasted off from the Guiana Space Center in Kourou, French Guiana, on the northern Atlantic coast of South America and reached orbit minutes later. Liftoff occurred at 5 a.m. ET (1000 GMT). "Today is a moment of pride for Europe as well as those around 1,000 individuals who have been involved in developing the world's most modern and competitive launcher system for small satellites," said Antonio Fabrizi, ESA's launch vehicle director, in a statement. ESA spent 700 million Euros (about $930 million) and nearly nine years developing the four-stage Vega rocket and plans to spend another 300 million Euros (about $399 million) on the booster's first five flights. The new booster is designed to serve as a launcher for small payloads to complement Europe's heavy-lift Ariane 5 rockets and the medium-class Russian Soyuz rockets that lift off from the Guiana Space Center. 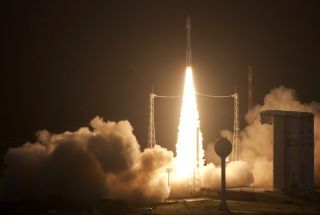 The Italian-built Vega rocket is named after the second-brightest star in the northern hemisphere and the produce of seven ESA member states: Belgium, France, Italy, the Netherlands, Spain, Sweden and Switzerland. The rocket stands about 100 feet (30 meters) tall and is 10 feet (3 m) wide, and has a total weight at liftoff of about 137 metric tons. The first three stages are powered by solid propellant, with the fourth stage — called AVUM — relying on a liquid propulsion system. Vega rockets can carry payloads of up to about 5,500 pounds (2,500 kilograms) and can deploy multiple spacecraft in different orbits. Each rocket can carry a primary satellite payload as well as a host of smaller microsatellites weighing between 22 and 220 pounds (10 and 100 kg). Vega is the latest rocket to join the launcher fleet at Europe's Guiana Space Center. Last year, the first Russian-built Soyuz rockets to fly from South America also began launching from the spaceport on flights that are also overseen by European launch provider Arianespace. "In a little more than three months, Europe has increased the number of launchers it operates from one to three, widening significantly the range of launch services offered by the European operator Arianespace," said ESA Director General Jean-Jacques Dordain. "There is not anymore one single European satellite which cannot be launched by a European launcher service." This ESA graphic depicts the flight timeline and major events for the first launch of the new Vega rocket on Feb. 13, 2012. The primary reference mission for the Vega rocket calls for launching payloads of about 3,306 pounds (1,500 kg) into an orbit about 435 miles (700 kilometers) above Earth. For today's launch, the Vega rocket carried two main satellites and seven tiny picosatellites into orbit for Italy. The first is the Italian Space Agency's Laser Relativity Satellite (or LARES), which is a solid sphere of tungsten that weighs about 860 pounds (390 kg) and will study how Earth's rotation warps the space around our planet. The second main satellite is the Alma Mater Satellite (AlmaSat-1) built by Italy's University of Bologna. The 27.5-pound (12.5-kg) microsatellite will test how small satellite technology can be used for future Earth observation uses and other missions. Xatcobeo: a mission to demonstrate software-defined radio and solar panel deployment. Robusta: a mission to test and evaluate the effects of low levels of radiation effects on transistors. e-st@r: a demonstration of an active three-axis attitude determination and control system, including an inertial measurement unit. Goliat: a mission to image Earth using a digital camera, and also measure radiation levels and micrometeoroids. PW-Sat: a mission to test an atmospheric drag augmentation device for de-orbiting CubeSats. MaSat-1: a mission to demonstrate various spacecraft avionics, including a power conditioning system, transceiver and onboard data handling. UniCubeSat GG: a mission to study gravity gradients. In addition to satellites, ESA officials plan to use the Vega rocket to test new spaceflight technologies. The rocket is already slated to be the go-to booster to launch the space agency's Intermediate Experimental Vehicle, a robotic space glider designed to test re-entry system technology. The launch is slated for 2013. SPACE.com contributor Charles Choi contributed to this report. You can follow Tariq Malik on Twitter @tariqjmalik. Follow SPACE.com for the latest in space science and exploration news on Twitter @Spacedotcom and on Facebook.